Having a great summertime party starts with sending out the best beach ball invitations you can find. Even if your party plans fall somewhat short of the sandy blue waters, festive invites can set a lighthearted tone for the entire event. Print these free options using Adobe Reader. 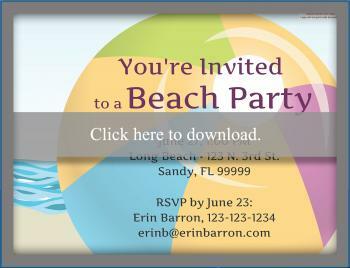 Select the one you want, whether it's the pool or beach-themed invitation, and edit in your party information! No better way to send out summer invitations than to use an actual beach ball as the card. You can purchase your invites in large quantities year-round through a party supply store or pick them up on clearance towards the middle of summer. To make your invitations, open each beach ball package and lay the balls flat. Use a black permanent marker to write out the party type (birthday party, pool party, beach party, etc. ), date, time, and place. If you need to include additional information (such as activities or foodstuffs), include an insert, as you may run out of room on your beach ball. Repackage the ball in a large padded mailing envelope. Or cover the original box with brown paper. Take them to be weighed at the post office, as it will cost extra for a bulky package. Instead of making your own beach ball invitations, you can buy them pre-printed and and just fill in your own details with a permanent marker. These inflatable invitations from Oriental Trading come in sets of 12 with their own containers. You can also choose to create your own invitations using cardstock and your computer. Purchase a printable cardstock in pastel color and use a graphics program to design your invitations. Use your software clipart to include a picture of beach balls, pools, or the sand. With the cost of printer ink so high, you may want to find cardstock with a design of a beach ball on it already, like these examples from from PaperDirect. Then change your word processing program margins to fit the card size and add your personalized details. You may want to do a single test print before running them all off, as you want to be sure it is centered on the page and not covering any of the design elements. Splash Invitations-This invite features a beach ball, sunglasses, towel, and a massive splash of water where your information goes. Get them blank or custom printed by MyExpression. Beach & Pool Party Invitations-Browse the large selection of beach and pool themed invites, including the ones featuring beach balls like "Beach Boy," "Beach Girl," "Play in the Pool," and "Dive in Pool." Save your money and time by sending out e-invites to all of the potential party guests. Before sending out an online invitation, be sure you have the most updated email address for guests and that they are all people who check their mail regularly. If you use an e-invite service that may have a different address than your own, let guests know so that your invite is not filtered into a "junk" mailbox. Additionally, try to send personal invitations to personal, not work, email accounts if at all possible. 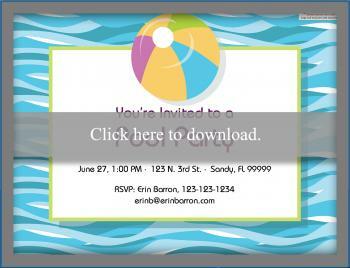 Evite has a nice summer invitation that features a seaside scene, complete with shovel and pail and beach ball. The "Invitation Options" feature allows you to ask guests to bring something (perfect for potlucks) or include an end-time (great for teen pool parties or events where parents may need to drop off/pick up children). Sendomatic has a great design with a vintage woman running through sand carrying a beach ball. Click on "Create Invitation" to get started. Sending out up to four invites is free, but over that will cost extra. Sending out beach ball invitations are a fun way to get guests in the mood for your summertime gathering.